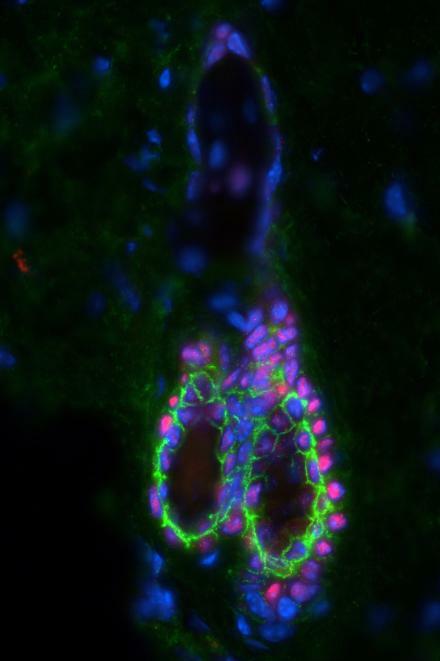 Credit: University of Bern, Image: courtesy of the laboratory of Prof. Dr. Eliane J. Mu?ller. For Christian Leumann, Rector of the University of Bern, the TCBM Platform reflects the University of Bern's long tradition in medicine and health. "This made us an important location for teaching and research in the area of advanced medicine", Leumann says. "One of our aims is to fill the gap between fundamental research and clinical application. The TCBM Platform is helping us make this happen". Prof. Eliane J. Mueller, Head of Molecular Dermatology and Stem Cell Research at the University of Bern and at Bern University Hospital, and Dr. Steffen M. Zeisberger, Director of Quality Assurance and Cell and Tissue Biobanking at Wyss Zurich, are co-leaders of the platform. "This first shared Swiss platform for translational and medical production of biological components is an important step towards future-oriented research for regenerative therapies", Uwe E. Jocham, President of the Board of Directors of Insel Gruppe AG, says. "The fact that we, as the Bern site of research, are playing a key role with the co-management fills us with pride. Because, with the Bern University Hospital, we want to be at the forefront of stem cell research and translation." The TCBM Platform is affiliated with the national organisation "biotechnet Switzerland", which in turn is part of the National Thematic Network (NTN) "Swiss Biotech". NTN represents the interests of the Swiss Biotechnological industry, while biotechnet Switzerland supports biotechnological research groups in academia and conveys their expertise to industrial partners. Through affiliation with biotechnet Switzerland, the TCBM Platform becomes visible for industry and Innosuisse. The TCBM Platform is financed, among others, by membership fees of public and private partners. Its administration is supported by the University of Bern's Faculty of Medicine. "We value this initiative across Switzerland, which seamlessly incorporates into the translational efforts of the University of Bern. We are therefore committed to ensuring its success", Hans-Uwe Simon, Dean of the Faculty of Medicine, reiterates. After the successful launch of the TCBM Platform, new members will now be recruited from the public and private sector and the Advisory Board constituted by personalities from science, industry and regulatory authorities. In cooperation with sitem-insel AG, the Swiss Institute for Translational and Entrepreneurial Medicine, and the emerging Center for Precision Medicine, first workshops and joint activities in the area of cellular therapies are planned for 2019. Mark Rubin, Director of the Department for BioMedical Research (DBMR) at the University of Bern, is looking forward to the cooperation: "The TCBM Platform will significantly enhance the development of our Center for Precision Medicine in Bern. Observations made from patients can be translated to model systems for study and the development of new therapies. I am most excited to welcome the TCBM." Prof. Eliane J. Mueller, Co-Leader of the TCBM Platform: "During the launch ceremony of sitem-insel AG in Bern, Federal Councillor Schneider-Ammann praised Bern for switching from user to provider in the area of translational medicine in Switzerland. I think the industry should take heed of this upward trend."